Eucalyptus globulus is grown extensively in plantations outside its native range in Australia. Concerns have been raised that the species may pose a genetic risk to native eucalypt species through hybridisation and introgression. Methods for identifying hybrids are needed to enable assessment and management of this genetic risk. 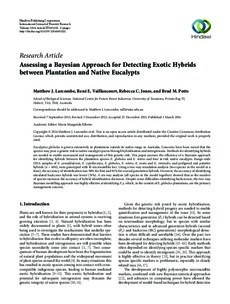 This paper assesses the efficiency of a Bayesian approach for identifying hybrids between the plantation species E. globulus and E. nitens and four at-risk native eucalypts. Range-wide DNA samples of E. camaldulensis, E. cypellocarpa, E. globulus, E. nitens, E. ovata and E. viminalis, and pedigreed and putative hybrids (n = 606), were genotyped with 10 microsatellite loci. Using a two-way simulation analysis (two species in the model at a time), the accuracy of identification was 98% for first and 93% for second generation hybrids. However, the accuracy of identifying simulated backcross hybrids was lower (74%). A six-way analysis (all species in the model together) showed that as the number of species increases the accuracy of hybrid identification decreases. Despite some difficulties identifying backcrosses, the two-way Bayesian modelling approach was highly effective at identifying F1s, which, in the context of E. globulus plantations, are the primary management concern.